A strong app marketing strategy ensures that your sales and marketing efforts don’t go to waste. You have limited resources, so make sure those resources are being used to accomplish your business goals. Keep reading below to learn how to plan your app marketing strategy to drive engagements and downloads. Why plan your software marketing strategy? Developing an efficient repeatable process to drive sales. Before you start planning app marketing strategies, you need to be clear on your marketing goals. A focused software marketing strategy will help you position your product in front of your optimal target market faster. Higher percentage of prospects turn into customers. You better understand the problem space – what are your prospects’ pain points? You learn how to speak your customers’ language & improve your pitch. The sales cycle time is the total length of time from your first contact with a customer to when you close the sale. You can find scaling opportunities such as via channel partners, joint ventures, or promotion opportunities. If you are in the process of bringing a new product or service to market, it is even more important to carefully plan your software go-to-market strategy. Particularly for mobile apps, you have only a short window of opportunity after your app first appears in the app stores to get on top-rated or most-popular lists. 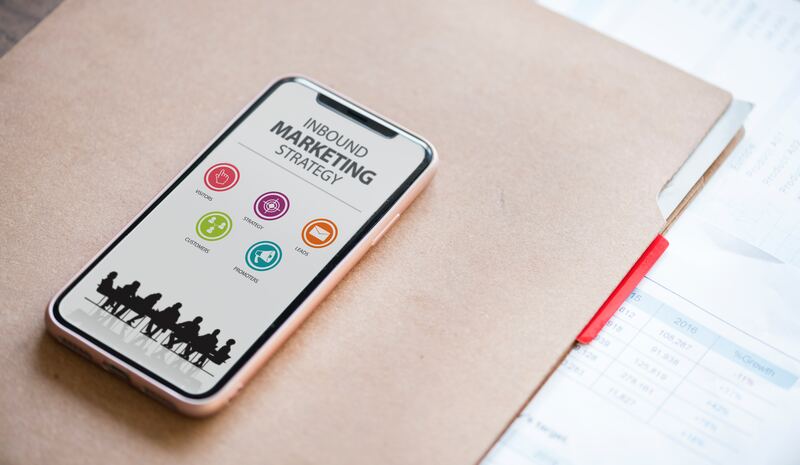 As you’re preparing your software for launch, you should start planning your app marketing strategy as early as possible. Don’t wait until you’ve finished all your development before you worry about marketing! Who are your specific target customers? What problem is your software addressing for your target customers? What is your messaging & value proposition? Where will your customer obtain the product or service? Which channels will you use for fulfillment, distribution, and support of your app? When will you introduce your app? When will you tell your customers? How will you communicate with potential customers? How are you going to implement the go-to-market launch plan? 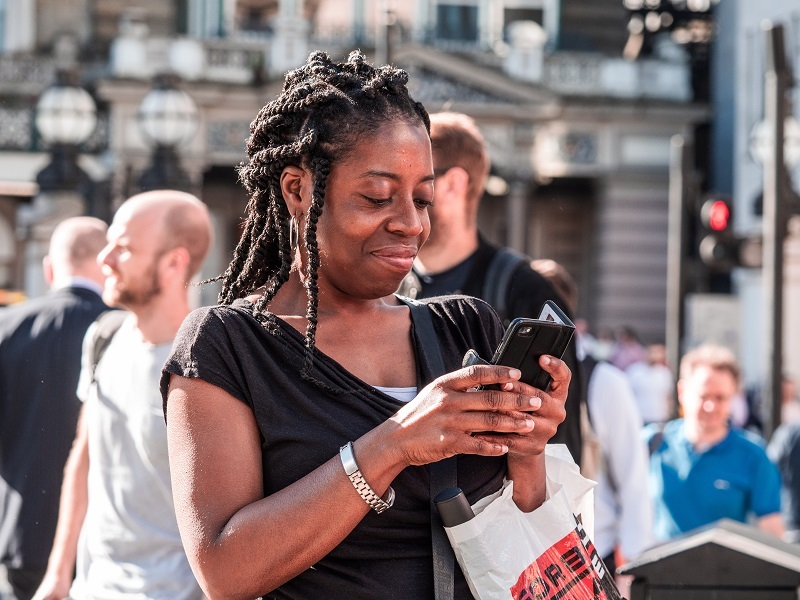 For more information on planning your app marketing strategy and launch, read this article on mobile application market research and this on executing a successful software launch. Then you can use our Go-to-Market toolkit to plan your app launch. 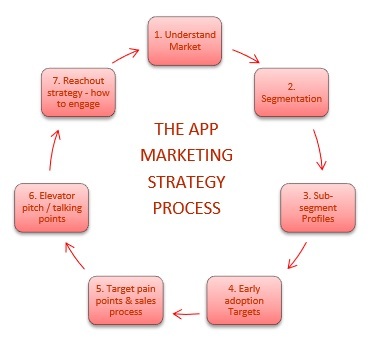 Okay, so you are ready to start planning your app marketing strategy. Simply follow the 7-step process below, one step at a time. It is important to complete each stage thoroughly before moving onto the next one – this exercise is not about writing a lengthy marketing plan, but about going through the thought process to make sure that you fully understand your market and your customers, before you start crafting positioning, calling prospects, or creating pitches or other materials. Your pitch will be a hundred times more effective if it speaks in your customers’ language and clearly addresses their top pain points. What is the size of this market? Is it growing? What are some of the key trends in the market? Who are the leaders in the market? How do they position their offerings? See if there are ways you can break down your market into smaller segments. This can involve not only potential customers, also other players/partners in the market. By creating segments, you are creating bite-sized targets for your marketing that you can then prioritize and develop targeted micro-messaging for. The more you know about your potential customers, the better you can target your marketing. In this step, you need to get into your customers’ heads to understand their challenges, their language, their values. What do they care about, what benefits will they listen to? What is the win-win proposition for them & you? Where do they prefer to get their information about new products? Who are the early adopters? Especially if you are launching a new, innovative product to market, having a laser-focus on early adopters will allow you to establish an early beachhead to grow your business. Who will likely not buy into your product until they see other people doing so? Which partners can help you influence which customer segments? Remember to stay focused – start with one or two top sub-segments and develop a strategy to win those first, before moving on to others. If you are just starting out, you will gain early traction faster with a focused approach. You can always broaden your marketing later after you have won your first niche. What is your target’s sales process? How do they make decisions on what to buy? Who is involved? How can you make it as easy as possible for them to solve their pain point using your software? The final step in your app marketing strategy is to figure out the best way to communicate your elevator pitch to each audience segment: How do you best engage them? Where and how can you communicate your message? This step involves putting together your marketing communications strategy so that your ideal customers can hear your elevator pitch through their preferred channels. Finally, you are ready to execute against your software marketing strategy. But make sure to keep re-evaluating your strategy as you execute and gather more market intelligence and experience. An app marketing strategy should never be static – it is a continuous cycle that helps you accelerate sales and reach your business goals. To read more about how to follow the 7 step marketing process, take a look at our eBook which comes complete with worksheets and templates that will help you implement the process. 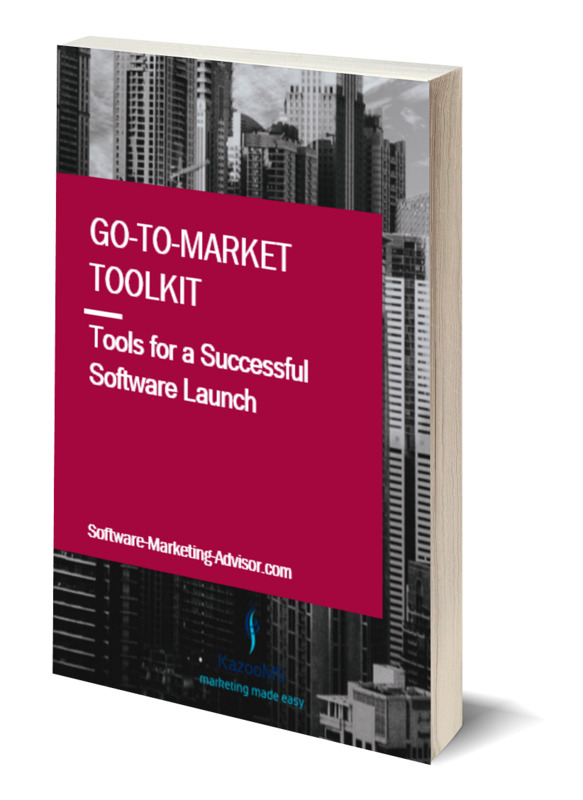 Or download our Go-to-Market Toolkit, which includes a Software Launch Guide, Go to Market Strategy Template and much more to help you plan a successful app launch.